There are moments in our lives that make us think about the end. I have two on my mind. First, sometime in my pre-teens, while racing my bicycle down the block with friends, pedaling way too fast, I slammed the bike straight into a car at an intersection, fell off, and hit the ground hard. Not much was bruised aside from my ego, but in that instant an alternate reality flashed before me. Later on, in my early 20s, while walking home in the winter, I tried to maneuver around a mattress blocking my path and instead slid on some ice, tripped over the mattress and hit my head hard on the concrete stairs in front of me. I heard a loud thud through my headphones and panicked. After texting a friend, who told me not to fall asleep, I rushed to the hospital for an MRI. Both times I was perfectly fine. The actuality of death is felt at specific points: being involved in an accident or averting one, seeing the dead body of someone familiar, experiencing celebrity death collectively. Someday we’re going to die. And we all wonder what it’s like, in continuum. Naturally, I’ve weighed various permutations of how it might happen, and how people around me might go, largely viewing death as the body easing into a state of failure. I’ve been under anesthesia twice and twice it felt like nothing. You’re conscious and then you’re not, and then you return. My anxiety about flying is directly related to an intense fear of crashing and dying, despite knowing the odds. Death thoughts defy probability and yet, consistently, it doesn’t matter. I can pinpoint Trump’s election as an event that made these dark thoughts more visceral. 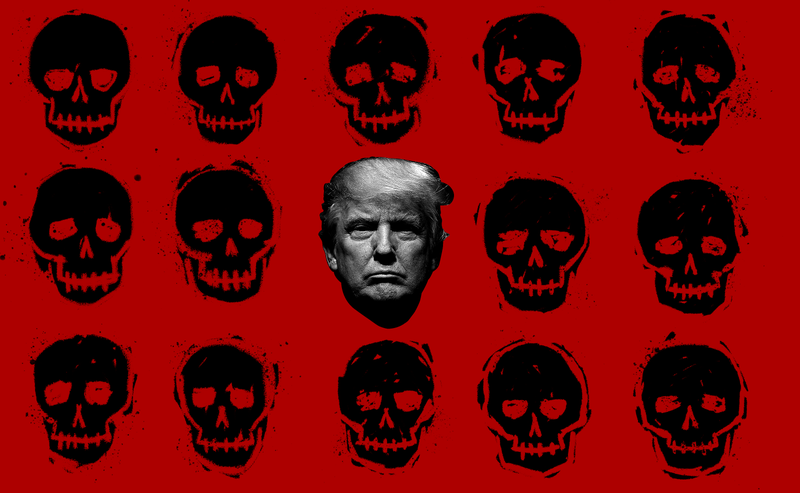 The running joke is that a Trump presidency means certain death, which even shows up in the way he speaks, routinely and vaguely spooking the public about “terrible” “things.” The cause for concern was immediate the day after the election—the results of which many processed like a funeral—when faced with a president whose desire to posture, among other things, consistently overrides better judgment. My fear of adverse effects of Trump’s presidency, compounded by the general threat of aging and the reality of losing people, has made me strangely conscious of mortality, an addendum to the sting of dread ever-present for black people in this country. A legitimate concern subconsciously replays in my mind, and maybe yours, is that the policies Trump’s administration enact will lead to more people dying, short-term and long-term and, metaphorically, as pieces of us wither as well. Melodramatic national conversations about the End Times only deepen the feeling of dread. As humans, we’re constantly at odds with the prospect of no future. That background noise in our brain has no doubt become louder, though not necessarily deafening. When I brought up the idea of Trump and death thoughts, my co-workers expressed similar anxiety. “I was trying to flirt with someone recently and I ended up talking about how we’re gonna get nuked,” one staffer recalled. Another suggested, “Trump feels more like we are all going to die imminently.” Stories about death and revolution feel strange, too. Embarrassingly, the end of Star Wars: Rogue One made me cry, as did the finale of Westworld, because it’s weird to see revolution play out like a dream. Existentially speaking, death is a symbol par excellence of non-being or non-existence, and, therefore, death anxiety can be understood, in Kierkegaard’s words, as the “fear of nothingness.” Death is understood by many Americans as a dead end, not a doorway. For Westerners, in particular those that take a more secular, rationalistic, scientific view of the world, death is by far the greatest evil to befall us, our most feared and despised foe. Death, despite what science tells us, remains the great unknown. And humans carry deep within them a powerful primal fear of the unknown. What happens after death? No one really knows. But the burgeoning public fascination with television programs on the supernatural, ghosts, spirits, demons and the demonic, and with individuals who claim to be able to communicate with and speak for the dead indicates our innate need to deny the finality of death and to try to make meaning of it. There are many ways we could meet our demise, but the threat of nuclear warfare has crossed my mind many times, a set of doomsday thoughts that really isn’t anything new. Similar to today’s articles citing “dread,” the lede for a January 1946 article about atomic bombs in The New York Times did the same: “That black cloud on the horizon so much bigger than a man’s hand is called the atom bomb. The destructive powers of the storm it can loose upon us are so great that civilization, already racked by so many torments, trembles in apprehension. The world now knows a fretful and uneasy peace, but men still live in the shadow of fear and their sleep is haunted by dreadful dreams.” Just as fear of Zika or Ebola existed, so did fear of yellow fever, and just as fear of warfare looms, so did Cold War anxiety, the knowledge of which doesn’t provide much comfort. What is the healthy line between dread and optimism? What good does being anxious do? Obsessing seems prudent, but also masochistic. I’ve scrutinized each of Trump’s appointments since he was elected, with each conservative figure he nominated possessing deeply destructive philosophies that appear to edge us closer to finality, be it through some effect of climate change, from antagonizing a world leader, having no access to abortion or just our leaders’ plain inefficacy. As Masha Gessen suggests, it’s our duty to reject the normalization of Trump and hold onto these feelings of dread. “The thing to do—and this is my recipe—is to continue panicking,” she told Samantha Bee. “To continue being the hysteric in the room, to say ‘this is not normal.’” Because that is the nature of pain and change. Frequently considering death at large could feel better than obsessing about it in our personal lives, if equally irrational. There’s nothing to do either way but remain stubbornly optimistic, aware that life and death exist in tandem, and so it goes.